By Anthony Crupi . Published on July 07, 2017. A Viagra ad of the sort NFL viewers aren't likely to see any more. TV networks are trying to keep a stiff upper lip as the once-lucrative erectile dysfunction sector has begun sagging like a doctored football in Tom Brady's throwing hand. According to multiple insiders, a certain little blue pill has all but vanished from the airwaves, and its absence will be particularly conspicuous during the upcoming NFL season. Nearly 20 years after the FDA first approved its use as an ED remedy, Pfizer's Viagra is losing its patent exclusivity, and that's a bitter pill to swallow for the TV business. Viagra hasn't aired a national TV advertisement since May 15, and network ad sales executives said the brand is unlikely to resurface, having sat out the 2017-18 upfront bazaar. Football fans should notice the dearth of Viagra spots as early as Sept. 7, when NBC is set to broadcast its annual NFL Kickoff Game. When the Chiefs and Patriots square off in Foxborough, their clash will not be interrupted by pitches for what was until recently the NFL's top-spending pharmaceutical brand; according to iSpot.tv data, Viagra last season invested nearly $31 million in pro football inventory. Ad sales bosses say that the disappearance of one of the NFL's top 40 highest-spending advertisers is a function of Viagra losing its exclusivity in the face of the impending launch of a generic version of the brand. Teva Pharmaceuticals is set to roll out a far cheaper variant of the compound on Dec. 11. "Once a generic gets in the mix, that usually spells the end of any direct-to-consumer advertising for the legacy brand," said one ad sales exec. "Rather than continue to market something they no longer have exclusivity over -- which really can only help boost sales of the new generic pill -- the pharmaceutical company will reallocate that portion of its budget back into its brands that are still exclusive." 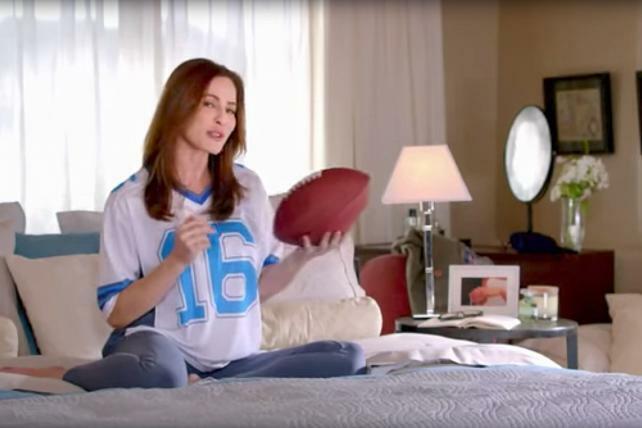 If the introduction of a generic alternative to Viagra will scrub all vestiges of the brand's distinctive commercial messaging -- say goodbye to the actress in the knockoff Detroit Lions jersey who fiddles around with the ol' pigskin while knocking off statistics about erectile dysfunction -- another equally memorable ED campaign may be on the verge of vanishing in the coming months. Network execs say that Cialis will lose its patent protection halfway through the NFL season, and while it hasn't stopped buying TV time altogether, its upfront presence has been noticeably diminished. "Cialis hasn't bought any of our NFL inventory in the upfront, and unless they come back in scatter, that's pretty much the end of ED," said one ad sales boss, adding that patent holder Eli Lilly would be more likely to keep supporting Cialis with TV buys if it can successfully reposition the compound as an over-the-counter remedy. In May 2014, Lilly announced that it had reached licensing agreement with the French drug manufacturer Sanofi under which the latter would begin selling an OTC version of Cialis upon the expiration of the original patent. That plan is contingent on securing approval of the U.S. Food and Drug Administration. Viagra and Cialis's twin Houdini acts come as the NFL faces a softer-than-expected interest from automotive and movie studio clients. Network sales execs expect that deferred revenue to come roaring back in the fall scatter market. Most recently, Cialis has bought time in Fox's coverage of the 2017 U.S. Open golf tournament and in select MLB games and Nascar races. The brand has also snapped up inventory in general entertainment programming such as TNT's new drama series "Claws" and ABC's "Shark Tank," as well as in NBC and CBS's respective nightly newscasts. While Cialis remains committed to a summer TV schedule, its creative rotation has shown signs of stagnation. After pulling two of its three active commercials in early May, the brand is now down to a single 60-second spot ("A Moment Turns Romantic"), which it first introduced in September 2016, just in time for the new fall TV season. An Eli Lilly rep did not respond to a request for comment regarding the company's Cialis spend. Sales execs estimate that Cialis last season spent as much as $22 million on NFL inventory. Combined with Viagra's total, that means a full-on divestment of ED from TV would remove north of $50 million from the NFL ad market. That's on par with what brands like Bud Light, State Farm, Honda and Nationwide spent on in-game NFL airtime in 2016. All told, Cialis in 2016 spent a little more than $130 million on national TV inventory, on par with Viagra. Among pharma brands, Viagra was the biggest investor in NFL inventory last season, followed directly by Cialis. But while the loss of this particular "lifestyle drug" category is far from insignificant, media buyers suggest that there are plenty of brands designed to alleviate more critical ailments that are likely to fill the ED gap. The NFL's other top pharma backers a year ago included Pfizer's Chantix, an antismoking brand that accounted for $17 million in in-game spend; Bristol-Myers Squibb's Opdivo (a cancer treatment, $10.7 million), Pfizer's Lyrica (a fibromyalgia treatment, $10.2 million); Bristol-Myers Squibb's Eliquis (an anticoagulant, $10 million) and Pfizer's Prevnar 13 (an anti-pneumonia vaccine, $4.13 million). From a demographic standpoint, the NFL audience is a sweet spot for the two ED brands. The median age of NFL viewers in 2016 was 50 years old, which according to the Annals of Internal Medicine is about the same age in which male sexual function begins to sharply drop off. Golf, which reaches an audience with a median age of 64 years, is also a big ED draw, while the NBA and its younger-skewing crowd (median age: 42) is a no-man's land for the category. Viagra and Cialis effectively have had a duopoly over the TV marketplace since 2011, when GlaxoSmithKline stopped buying time to promote Levitra. One much-lampooned Levitra ad was memorable for its perhaps too on-the-nose portrayal of a middle-age man zipping an official NFL football through a tire swing as his [far] younger wife cheers him. ED ads became such an ingrained part of football culture that they even managed to break through to the mega-stage that is the Super Bowl. In 2004, Levitra ran a 45-second spot during CBS's broadcast of XXXVIII that featured former Bears head coach Mike Ditka growling about how baseball had "gone soft" compared to the unimpeachably tough-guy spectacle that is football before a voiceover encouraged fans to "take the Levitra challenge." Later in that same game, Cialis aired a spot that introduced some 89.8 million Americans to the concept of the four-hour erection. If nothing else, the ED subphylum has made for some impactful creative. So indelible is the image of the couple rather inexplicably lounging around outdoors in side-by-side bathtubs that Cialis went on to incorporate the tubthumping duo into its logo.